Lydiate has made six appearances for Ospreys since arriving from Racing Metro. 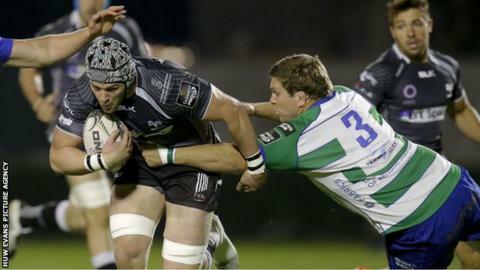 Ospreys coach Steve Tandy has praised flanker Dan Lydiate ahead of Saturday's Pro12 derby match with Cardiff Blues. The 27-year-old Wales international joined Ospreys in autumn 2014, cutting short his stint a Racing Metro. Tandy says Lydiate faces a battle to be regular starter for the region, but has been impressed with the player's positive attitude. "He hasn't come in and thinks he'll know it all. He's been a great acquisition for us," he said. Ospreys face Blues at the Judgement Day event at the Millennium Stadium which also sees Newport Gwent Dragons play Scarlets. Former Newport Gwent Dragon Lydiate has made 46 appearance for Wales, and played in all three Tests for the successful 2013 British and Irish Lions in Australia. Tandy says Lydiate's three-way tussle with Australia-born Wales flanker James King, 24 with three caps, and Canada's Tyler Ardron is a "ding-dong" affair. "He's [Lydiate] been great - how hard he works, how keen he is to pick up how we play; how we are keen to develop him in certain things and I just think he's a good character to have in the group," added Tandy. "And he adds to our competition. Him and Kingy are going toe-to-toe with Tyler and things and ultimately for us to be competitive, we need real competition and there's a real ding-dong battle going on there. "But as a character, settling in, he's keen to learn." Tandy, himself a former flanker, believes Lydiate will continue to improve. "His game will only get better with us," said the former open-side. The Ospreys boss believes number eight Dan Baker and wing Eli Walker can also make their marks at Millennium Stadium in front of Wales coach Warren Gatland as he ponders selection for the 2015 World Cup.